Just played at The Bridge Theater at Shetler Studios at 54th & Broadway in NYC! “She was so incredibly funny, such energy, and she engaged the audience to where we were calling back answers to her. It was a great show.” -Jake C.
“Wow. Alicia is a force of Nature, and an incredible actress. She is willing to share the most intimate details of her past, even if it provokes some uneasiness in herself and her audience! She reminds me a little of Lennie Bruce, and at times, Margaret Cho. She is a superb storyteller, and provides much food for thought. Bravo, Alicia. You are a brave and funny Soul.” -Stephen B. “This show was HILARIOUS and profound. There were times I was bent over laughing. 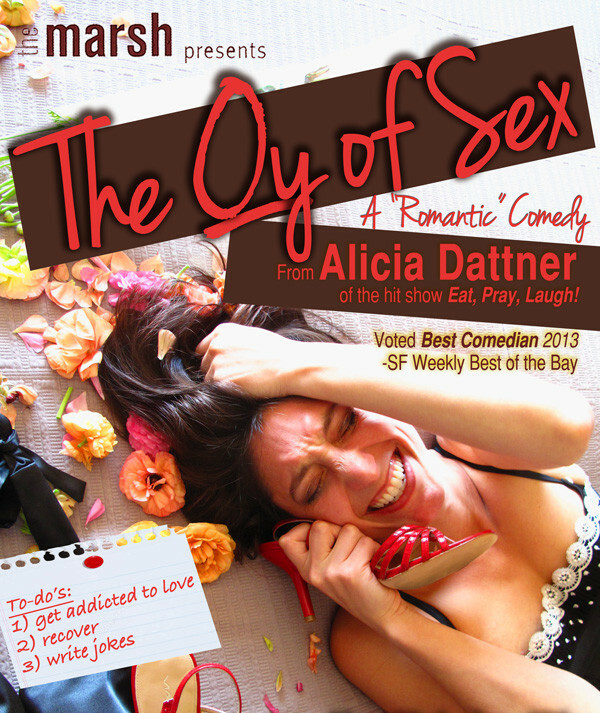 It’s official, i’m now an Alicia Dattner fan.” -Vivian P.
“What a wonderful evening. I loved her transparency, rawness and hilarity. Something about it got in me.” -Lynn M.